It is due to the initiative of Professor Amalendu De that the grave of Rokeya Sakhawat Hossain, one of the vanguard thinkers of equity and rationalism in the subcontinent and a great spokesperson for human rights, was found in Sodepur, near Kolkata. Professor Amalendu De died in the early hours on Friday, 16 May, 2014. On that evening, this news was intimated by his student, AKM Shahnawaj, a renowned professor at Jahangirnagar University near Dhaka. He leaves behind innumerable fans in both Bengals. This famous historian had held the President and Secretary post of the Asiatic Society of Bengal, at Kolkata. He was the Guru Nanak Professor of History at the Jadavpur University. He was the President of the Indian History Congress held in Aligarh in 1982. Among his seminal works, ‘Bangali buddhijibi o bichhinnotatabad’ (Bengali intellectual and separatism) is considered a gem in terms of its reflecting the sociological realities of the time. This book has been translated into Japanese. He was intensely committed in building a rational humanist society. He was pained by the partition of the country on the basis of religion. 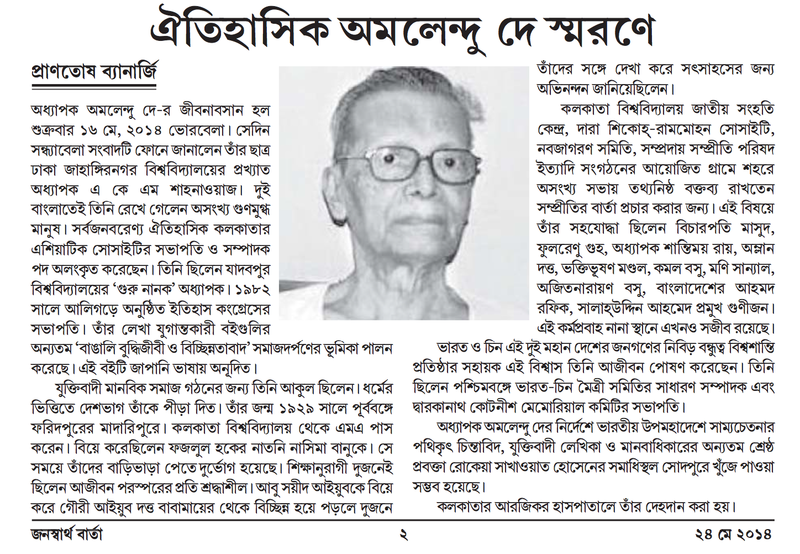 He was born in 1929, in Madaripur, in the Faridpur district of East Bengal. He did his MA from the University of Calcutta. He had married Sher-e-Bangla Fazlul Haque’s grand-daughter Nasima Banu. At that time, they faced problems in renting a house. The education-loving couple was respectful towards each other throughout their lives. When Gouri Ayub Datta married Abu Sayid Ayub and got alienated from her parents, the De-Banu couple met Gouri and Abu, congratulating them on their steadfast honesty. Through organizations like Calcutta University Jatio Sanhati Kendro, Dara Shikoh – Rammohan Society, Sampraday Sampriti Porishod (Communal Amity Council), etc, he spoke in cities and villages, spreading the message of communal harmony on the basis of objective facts. In this, his compatriots were Justice Masud, Fulrenu Guha, Professor Shantimoy Ray, Amlan Datta, Bhaktibhishan Mondal, Kamal Basu, Mani Sanyal (Translato’s note: Mani Sanyal was a stalwart of the Communist Party of India who became the deputy mayor of Calcutta), Ajitnarayan Basu, Ahmed Rafik, Salauddin Ahmed and other luminaries. This work still lives on in many places. Throughout his life, Amalendu De believed that close friendship between the peoples of India and China was very important for fostering world peace. He was the general secretary of the Indo-China Friendship Society in West Bengal and the president of the Dwarakanath Kotnis Memorial Committee (Translator’s note: Dwaranath Kotnis was an Indian doctor deputed by the Indian National Congress to assist the Chinese Communist Party. Netaji Subhas Chandra Bose, the then-president of the Indian National Congress, issued this appeal. Dr.Kotnis served as a self-less doctor to Mao’s People’s Liberation Army and died during the revolutionary war waged by the PLA). Professor De’s dead body was donated to Kolkata’s R.G.Kar Medical College.